Dr. Pixie McKenna has held her certificate as a general practitioner for 15 years, and is the leading female media medic in the UK. Having appeared on numerous TV and radio shows, Pixie is an experienced and engaging speaker on a wide variety of medical topics. 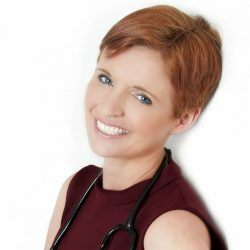 Dr Pixie McKenna is the UK’s leading female media medic, best known for her role in Channel 4’s primetime, BAFTA-winning medical series ‘Embarrassing Bodies’ and ‘Embarrassing Bodies: Live from the Clinic’. In addition to her work on the hit show, she has presented several series of ‘Freaky Eaters’ for BBC3 trying to tackle some of the UK’s weirdest food phobia/fetishes. Furthermore, Pixie has investigated the myths and realities about food and health advice on Channel 4’s ‘Food Hospital’, and on ‘Health Freaks’ she dealt with bizarre home remedies and put the ones she believed might just work to the test! As well as these major flagship shows, Pixie has appeared on a variety of other programmes as wide ranging as ‘Celebrity Mastermind’ to ‘This Morning’. She also hosts the weekly ‘Air your Ailments’ slot on Ireland’s Today FM. When not filming or on the air, Pixie spends her time writing columns for the Irish Mail and Best magazines. Pixie obtained her certificate in general practice training and membership of the Royal College of General Practitioners in 1999, and now functions as a GP at London’s Harley Street. She regularly attends and hosts Media Medic Events in London. Having studied speech and drama from the age of five, Pixie is an accomplished speaker on a variety of medical topics, with dermatology, women’s health, sexual health and health promotion being her specific interests. Pixie released her first book, The Handbag Doctor, through Kyle Books in 2010.